A stunned world watched as an inferno consumed the roof of the French capital’s cathedral yesterday evening (15 April) and then as the firefighters fought to contain the blaze from causing more major damage to the structure of the 850 year-old church. This morning (Tuesday 16 April) the fire has been declared completely extinguished and an assessment of the full extent of the damage is underway. 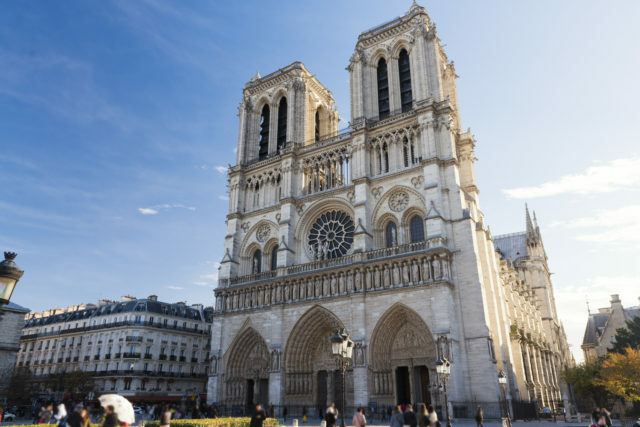 From reports and pictures it seems that although the damage is tremendous and the roof with its famous steeple has been completely lost, the vaulted stone ceiling largely remained intact, keeping the burning embers from the roof from falling into the main body of the cathedral. Furthermore, it appears from reports that all three of the great rose windows in the north, south and west of the cathedral have survived and the great organ, although badly damaged by water rather than the fire, has not been entirely destroyed. The North Rose Window in the transept is particularly precious as it remains entirely original from 1250, the other two contain restoration work from the 19th century although of course their survival is a cause for celebration too. It was also confirmed last night that various priceless artifacts were also rescued from the cathedral as the fire took hold. Macron also pledged to launch an international funding campaign and hundreds of millions have already been offered. This morning it was reported that François Pinault, chairman of the Kering Group the owner of Château Latour and Clos de Tart, had promised €100m to repairs and soon afterwards Bernard Arnault, CEO of LVMH and the owner of Cheval Blanc and Yquem, pledged another €200m. “In the wake of this national tragedy, the Arnault family and the LVMH Group pledge their support for #NotreDame. They will donate a total of 200 million euros to the fund for reconstruction of this architectural work, which is an integral part of the history of France,” LVMH said in a statement. Meanwhile, the Charlois Group that owns the Saury, Berthomieu & Leroi cooperages which produce barrels for the wine and spirits trade has reportedly promised to source the best oak trees for new beams to reconstruct the ribbed ceiling known as “the forest”. An investigation into the cause of the fire is underway, many suspect it may be linked to restoration work that was taking place on the roof.